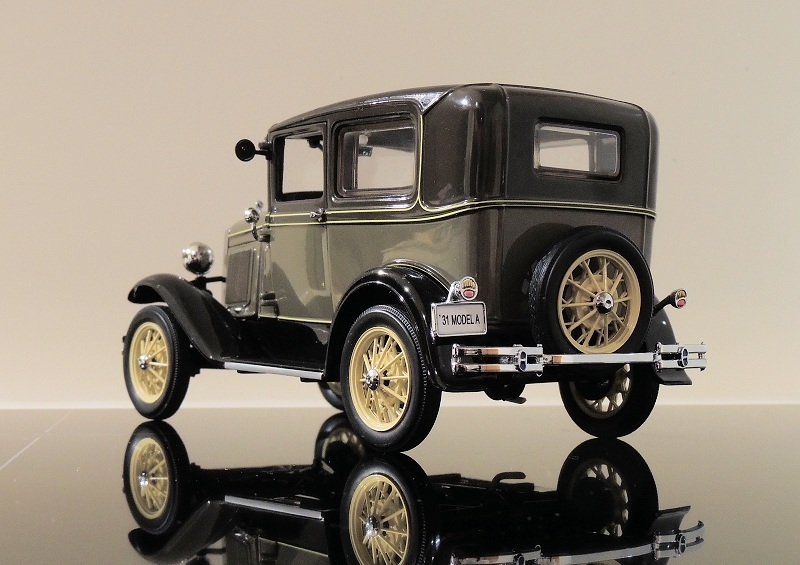 “Henry’s Made a Lady out of Lizzie” was the song that marked the arrival of the 1931 Ford Model A, a discernible upgrade from the tired Model T Ford ‘Tin Lizzie’. 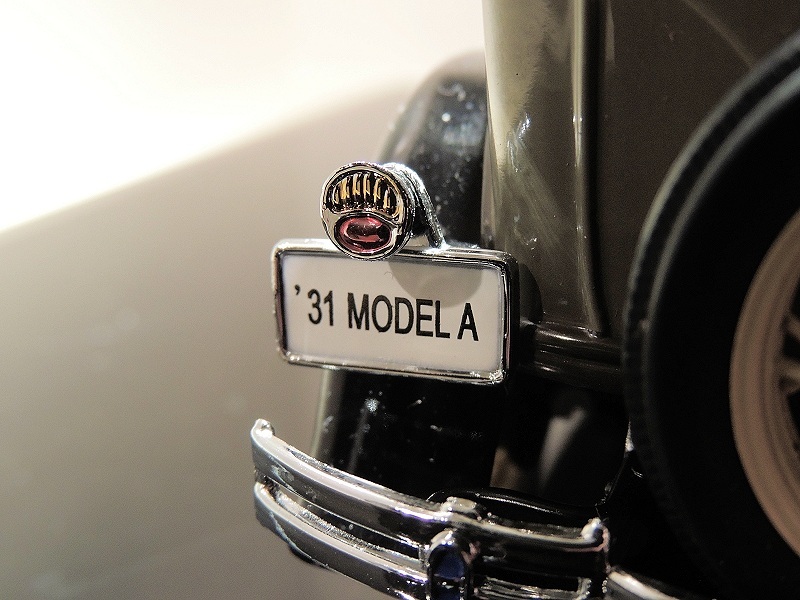 Economical yet elegant, the Model A was a roaring success, selling over two million by its second year of production. If you’re after a model or two of this lovely old car, try Sun Star. You won’t be disappointed. Certainly not in quality, and certainly not in quantity. 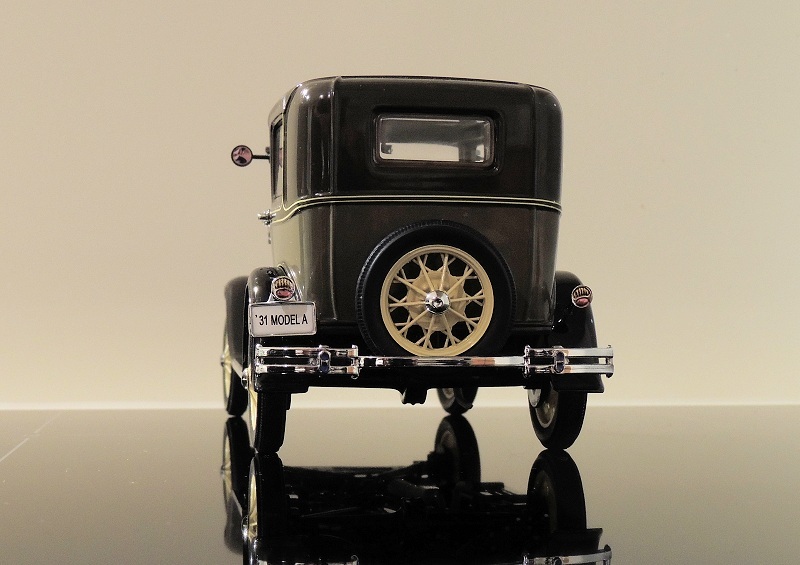 The brand makes six or seven different 1:18 Ford Model A variants; the Tudor sedan, the Roadster, the Cabriolet, a Tow-truck, a Fire Chief, and a Pick-up ute. A veritable Van Gough palate of colours is also on tap, but for this review, it’s the Tudor sedan in Chicle Drab with a Copra Drab roof. My first impression of this model is – it’s heavy. Very heavy. Everyone who picks it up, especially after having looked at my AUTOart and Bburago models, almost drops it with an exclamation of surprise. It’s good. This heaviness is the product of decent, solid plastics and metal that have obviously been used extensively in this model. Thus it exudes that degree of quality and craftsmanship which, I believe, is exclusive to Sun Star. 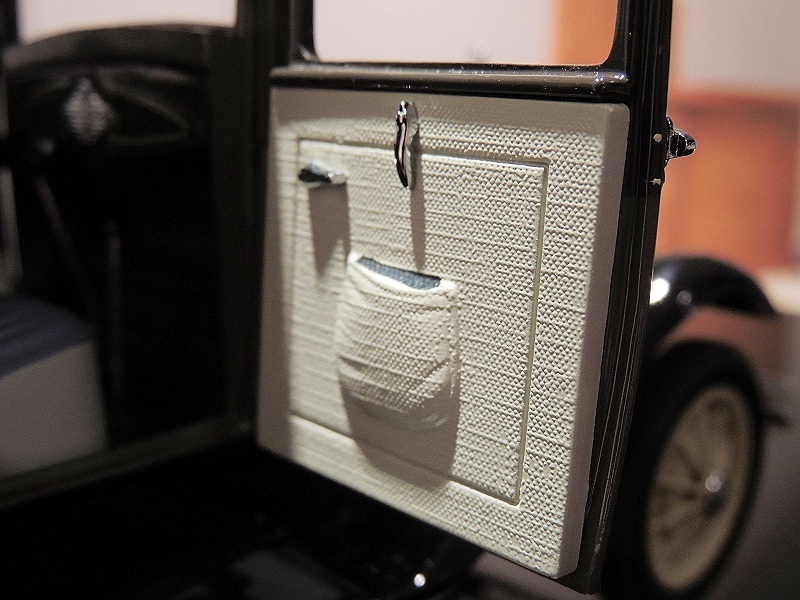 The model is cased in a black window box with ‘1:18 Ford Classic Collectibles’ written up the top. That’s right. The classic, pre1950s range of Fords does not appear to be part of Sun Star’s USA Collection, which is good. It means that the taint of Chevy and Mercury stablemates will not tarnish the range of fine classic Fords which are an embodiment of Henry Ford’s own “Quality is doing it right when no one else is looking” adage. The model Model A is screwed onto a plastic stand, with a labyrinth of cardboard and plastic covers requiring removal. The exterior is beautiful. The feel and detail are superb. The bumper bars are actually metal, the grille is a photo etched slab of sledgehammer-resistant plastic, and fine chrome touches and solid craftsmanship are second to none. The yellow pinstripes, the wire wheels, the delicate door handles, the bonnet louvres – everything is so precisely crafted. The only fault I can find with the exterior is the fact that the Ford emblem on the grille is not stamped straight. Everything else is brilliant. 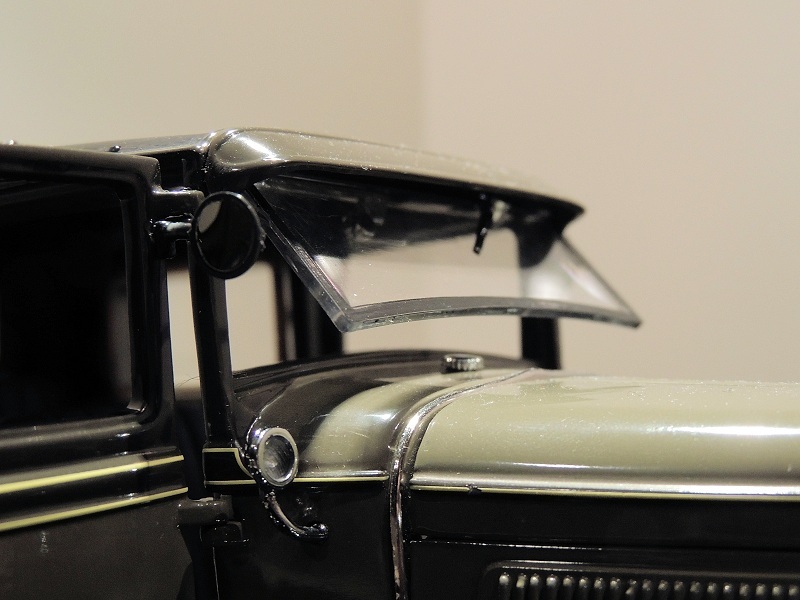 One feature about this model that may not make itself instantly known is the functioning air-conditioning system, a derivative of which is still used in modern cars today. The windscreen can be pushed open from the inside to let in fresh air or just make a good display. Good on Sun Star for replicating that. It would have been easier to just glue the glass piece, but no, they’ve hinged it and it opens. Bravo! The interior is not carpeted, but we have a very presentable display nonetheless. One impressive feature is the inside of the doors. They are beautifully textured to resemble fabric, and they do the job exceptionally. Similarly, the seats are actually made of a rubbery material, and thus, when sinking your finger into them, you could be forgiven for mistaking them for leather. 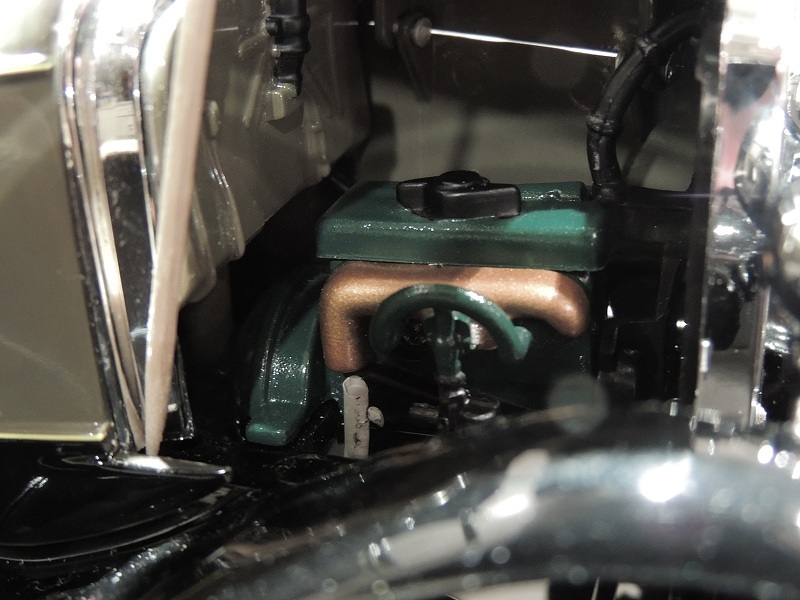 The dash is simple, like the real one, but…the centre piece of chrome is meant to be instrument panel! Instead, it looks like a cheese grater or a radio speaker. Could be better. Opening the twin-hinged bonnet reveals a good, if not outstanding, engine. It’s a little green box with some piping, and on the whole, it looks quite reasonable. But if one was in a pedantic mood, if there was no chocolate on hand, and it was overcast day, the engine could be seen to be a little crude. In normal circumstances, it is quite presentable. I don’t usually make a mention of the underside in my reviews, mainly because there is not much going on down there in most models, aside from a patent pending warning and a ‘Crafted in China’ notification. 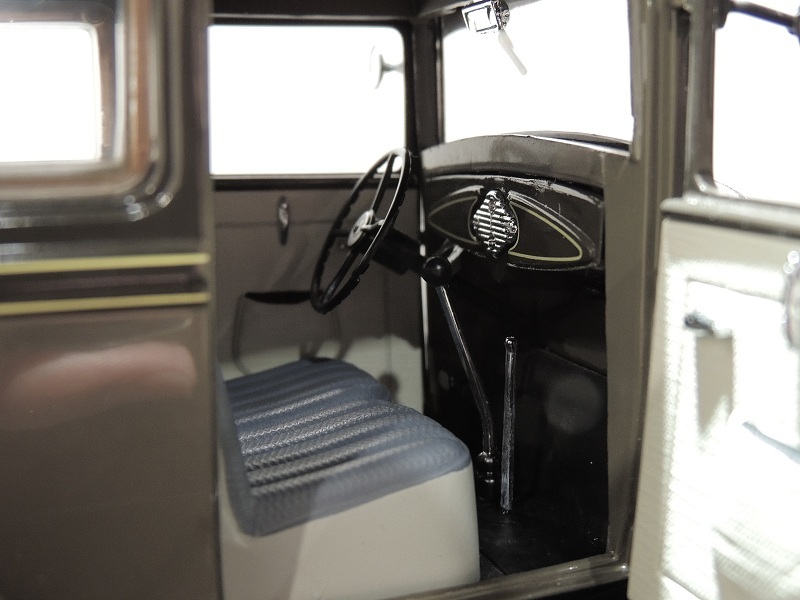 But on Sun Star’s Ford Model A, the undercarriage is something to write home about. It is fully detailed with the recognisable V-shaped bars, transmission shaft, and all manner of mechanicals that, if one was to trace from the engine, would find travels along the correct path to the correct place. “Quality is doing it right…” said a famous man. Yes, indeed, Henry Ford would be proud of Sun Star’s efforts with the Model A. Not only is it incredibly well-made and detailed, it also represents incredible value for money, at a mere $115.00AUD ($83.05USD). On that score, Henry Ford would be over the moon. And so should you. 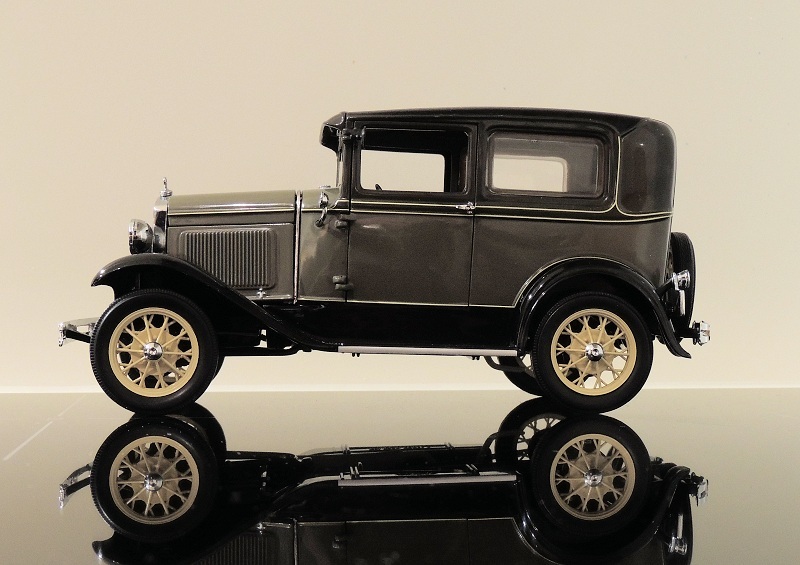 2 Responses to "REVIEW: Sun Star 1931 Ford Model A Tudor"
Could you please tell me where I can purchase one of these Ford Model A 4 Door Copra colour and costs please. Do you ship to New Zealand if so what are your charges p,ease. Check the retailer link. We recommended ALL site sponsors for your purchases. Support them as they support us!